Check out the new climbing class at Blaze Sports! 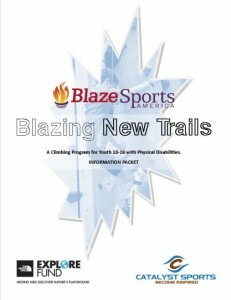 Blazing New Trails is a program that will introduce youth with physical disabilities to a unique, life changing active experience through the sport of climbing. Climbing fosters a variety of unique skills such as confidence, teamwork, cooperation, communication and leadership and also requires individuals to literally step outside their comfort zone and achieve new goals they never thought possible. 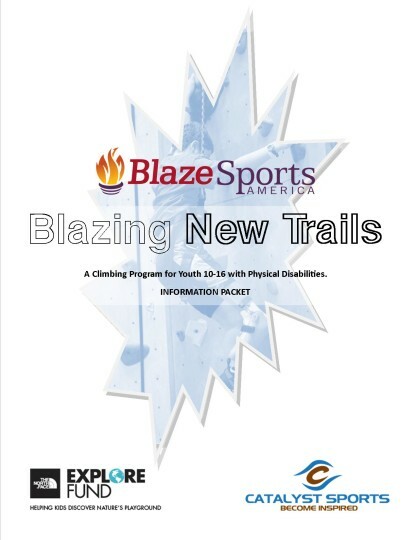 Located in Atlanta, Georgia, the Blazing New Trails Program will consist of 4 indoor climbing sessions led by the team from Catalyst Sports. Sessions will introduce the participants to the basics of climbing including knot tying, belaying, safety considerations and efficient climbing technique. The culmination of the training sessions will be an outdoor climbing experience where participants will have the opportunity to climb at the beautiful mountain setting of Sand Rock, Alabama. Hurry! Just a few spots remain open for this September 2013 class. Ages 10 – 16.